These relics consist of a royal instruction issued by King Seonjo during the Japanese invasion in the late 16th Century, appointing Monk Seonsan, who volunteered to lead a group of monk soldiers, as Dochonseop (highest leader of monk soldiers) and a letter written by King Jeongjo (r. 1752-1800) praising his loyalty. Monk Seosan (aka Hyujeong/1520-1604) played a conspicuous role in defending the country against the Japanese invaders during the Japanese Invasion of Korea in 1592 by leading a group of 1,500 monk soldiers at the age of 73. The royal instruction was first issued at the initial stage of the war but was reissued in 1602 (the 35th year of King Seonjo’s reign) after the destruction of the first one by fire. As for the letter written by King Jeongjo, it is said to have been sent to Daeheungsa Temple in Haenam on the occasion of keeping a portrait of Monk Seosan at the temple in 1794 (the 18th year of King Jeongjo’s reign). The letter was written on a sheet of light yellow satin silk decorated with flower and cloud patterns. 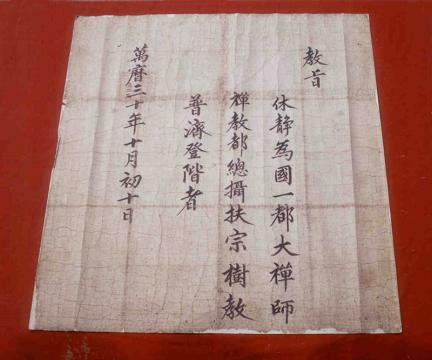 A seal impression is affixed at the end of the letter, containing two Chinese characters “弘齋” (pronounced Hongjae) indicating that it was handwritten by the King himself.